Do you like to roll your own cigarettes? Do you know the importance of rolling papers to your smoking experience? If you do, then you already know why finding the right rolling paper is important. Whether you’ve been smoking for years or you are just starting, the quality of rolling papers you use will define your smoking experience. A lot of smokers, especially the beginners don’t know the importance of rolling their cigarettes with quality paper because they don’t know the role it plays in smoking experience especially in terms of product conservation and taste. Aside from several benefits quality rolling papers provide, rolling your weed in quality rolling paper can make an eighth last twice. Smoking a cigar provides an enjoyable experience, so if you enjoy smoking a cigar, it is best to learn to roll your own cigar. Cigar rolling is not new and a lot of men and women roll their own consumption for a unique experience. If you want to personalize your smoking experience, it is high time you started rolling your cigar. Everyone has a favorite paper but choosing affordable quality paper will provide you with great smoking experience. And if you are looking for a rolling paper with personality, Kashmir rolling papers offer you style and personality. If you want to roll your weed smoothly and enjoy a great smoking experience, you need high-quality rolling papers. Nowadays, people seek for the healthiest rolling paper to roll their weed because they are health conscious. There are different brands of papers out there but not all of them are good for your health. If you are health conscious and want to have a great smoking experience, Kashmir rolling papers are the best on the market. 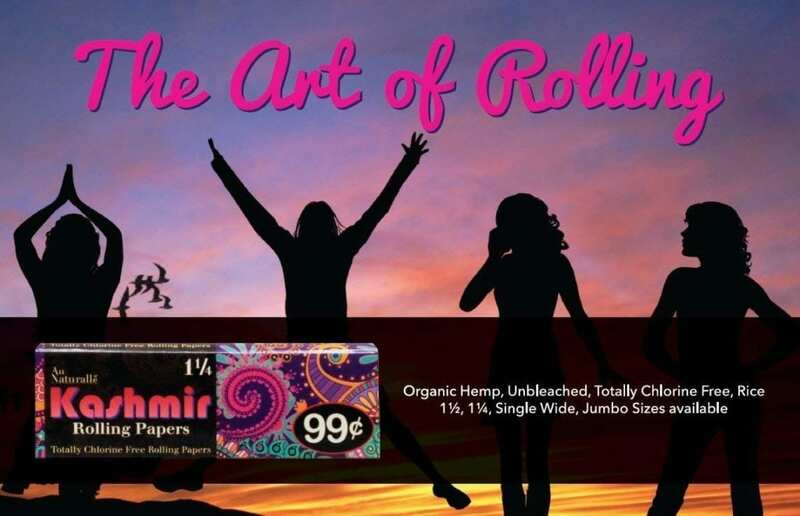 If you love rolling it yourself and you have rolling skills, this organic paper is the perfect choice for you. This paper is one of the thinnest weed rolling papers on the market. With its durability and affordability, you are sure to love it. The paper will reward you with not only a smooth burn but even burn. It is natural, 100% perfect for rolling hemp, made in the USA and 110 x 54mm. So the paper is wide enough to accommodate your hemp. The best thing about this paper is that the 32 leaves in a pack cost just 99cent. It is simple to use; whether you are just starting to roll hemp or you’ve been rolling for years, this paper will not disappoint. Kashmir 100% Organic Hemp 1-1/2 Rolling Papers are 100% organic rolling papers made for hemp. As an all-natural paper and gum, the papers have no additives. Each paper is 78 x 60mm and the 32 leaves in a pack only cost 99¢. It means you don’t have to break the bank to buy these papers. These papers are smooth burning, high-quality and healthy. Despite the quality of the paper, a pack costs less than $1. That is a great deal considering the benefits the papers offer. If you are looking for a natural rolling paper with no additives to roll your hemp, search no further because Kashmir has what you need. Your health is important and now that it’s clear that hemp offers a lot of benefits, you need a paper that can complement the health benefits. Kashmir 100% Organic Hemp 1-1/4 Rolling Papers remain people’s choice because of the quality and naturalness. Don’t buy just any paper from the market; buy the quality paper. With 32 leaves in a pack costing just 99 cents, you will never run out of papers. Spice up your smoking experience with quality rolling paper that can provide you with health benefits. At just 99 cents, you will get a pack of paper containing 32 leaves. Getting quality paper under $1 is not easy but Kashmir is only concerned about your health and smoking experience. All-natural and chlorine free, this paper has no additive and it’s 100% perfect for you. It is 110 x 54mm, so it is wide enough to accommodate your hemp. It rolls smoothly and when you roll your hemp with it, it gives you a smooth, even burns. At 99 cent per a pack of 32 leaves, you can’t run out of papers. If you want to puff more sticks of hemp without spending too much money, getting Kashmir Unbleached 1-1/2 Rolling Papers and rolling your hemp is the best. Imagine rolling as many as 32 sticks for just 99 cents. That is what you get when you buy Kashmir Unbleached 1-1/2 Rolling Papers. You get quality at the most affordable price. This chlorine-free, all-natural paper has no additives and remains the most affordable on the market. Made in the USA, these papers are healthy, organic, wrap smoothly, burn smoothly and provide the right taste. 100% organic hemp, all-natural paper and gum and no additives are the characters of these papers. But not just those, the papers are affordable, high-quality and provide the perfect smoking experience. Whatever you want to wrap and smoke, having a quality rolling paper is a must. If you are looking for papers that can give you the right smoking experience at an affordable rate, Kashmir papers remain the best. You can create a unique smoking experience today by choosing one of the quality rolling papers Kashmir has to offer. This entry was posted in RYO LifeStyle Blog and tagged kashmir rolling papers, Rolling papers.